CARDIFF-BY-THE-SEA – When Jason Santos joined the San Diego Sockers reserve team this winter his one goal was to make the professional club. Several weeks ago, before the team left for Monterrey, Mexico to compete in the FIFRA Championships, Santos’ goal was realized.General manager John Kentera and head coach Phil Salvagio made the decision to call Santos up because of his skills and what Kentera called his “bulldog” attitude. “I was very happy we were able to give him the opportunity to play,” Kentera said. “Santos has done a great job,” he added. “He’s played fantastic on the reserve team; he practices hard. People that really don’t follow us, or even if they do follow us, don’t realize we wouldn’t be where we’re at right now without this reserve team,” Kentera said. Santos received the call from Kentera where the two met up at a coffee shop in Cardiff, signing him to a contract for the rest of the season. “It was a great feeling,” Santos said. “Playing with the first team, it was a great experience, being able to get called up and play with a bunch of the great guys,” he said. Santos even earned an opportunity to play in the FIFRA tournament, which the Sockers won. Since joining the first team, the players have welcomed him with open arms, he said. “They’ve continued to give me pointers (about) the indoor game,” he said, adding that he’d never really played indoor soccer before, let alone at the professional level. Not only that, but he’s learning how to play through all of the noise that goes on during the games. The 24-year-old midfielder who still resides in Cardiff, attributes his mom for getting him started playing soccer when he was four or five in the Cardiff-by-the-Sea recreational games at Cardiff Elementary School. He played soccer at La Costa Canyon High School before going on to play at UC Davis, being named the team’s most inspirational player in 2010. His brother Joe also plays on the reserve team, something that’s been a lot of fun, Santos said. “We laugh and he grows a lot every time he plays with me; I grow a lot playing with him. He’s definitely just as physical and just as skilled, so it’s a fun experience,” he said. 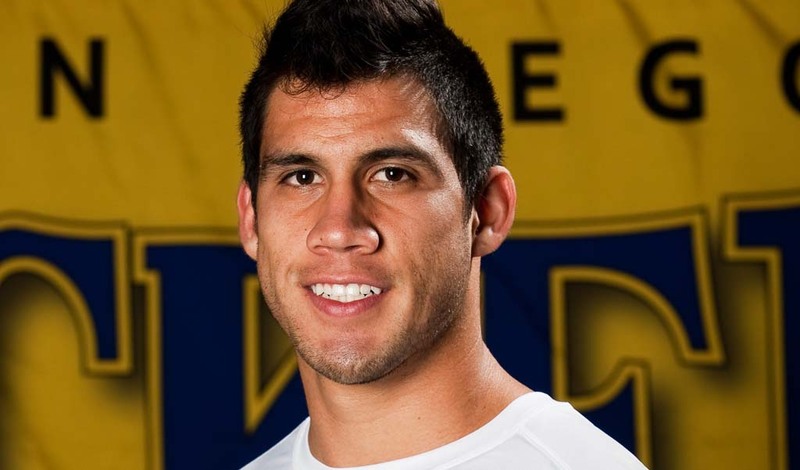 “It’s a great honor,” Santos said about playing for the Sockers. “For me, to be able to play for the county that I grew up in and be able to wear that Socker’s uniform and compete against other counties and states and even in different countries, it’s a great pleasure and I can only hope to wear this jersey with pride,” Santos said. The 2012 season is nearly over, but Santos is looking to continue to grow with the team and to continue to learn more about the game. “He’s definitely got a future with us,” Kentera said.